The no freezer required, individually-packaged PretzelHaus 6 oz. lightly salted pretzel is a practical, profitable treat for your concession stand, convenience store, carnival, golf course, or swimming pool! Since these shelf stable pretzels are never frozen, preparation time is shorter than that of frozen varieties, and there's no risk of serving a pretzel with a cold center. Simply microwave the hand-twisted snack to an ideal temperature in as little as 25-30 seconds. Alternately, they can be warmed to 110-120 degrees Fahrenheit using any standard foodservice warmer, convection oven, or toaster oven. When microwaves or warmers are unavailable, these pretzels can even be served straight from the pack since they remain soft, moist, and maintain an even consistency. These soft pretzels are individually packaged, and heat up in the microwave in just 30 seconds. They taste very fresh straight from the microwave, unfortunately they do not taste salty at all. That is my only complaint, more salt would be nice but everything else is great! I love that these pretzels are shelf stable and don't need to be frozen or refrigerated; sure does save on space. I'm not sure about the "lightly salted" part, but we keep selling out of them and have had zero complaints! We actually heat them up in our pizza oven for approx 4 min so the outside gets a bit crisp. It's a nice size pretzel and very cost effective! Very good but would like to see a tad bit more salt, not a real problem as you can always add some. very soft and flavorful! Be prepared for the quantity you will receive. These pretzels are large and last a long time if included on a buffet. They're individually wrapped and can easily be microwaved in their own packaging which makes them so convenient. The truth is I can't say enough good things about these pretzels. When I ordered them – I did so not having any idea what they would really be like. I know that there were many good reviews – but you never know until you get them. Once I opened a case and sampled the first one – I was amazed! These pretzels are the softest, chewiest, most delicious soft pretzels I have ever tasted. I'm telling you the truth. And our customers agree! Great pretzels, they taste really nice, but need to be cooked in the bag provided. besides that, served with cheese, or salt, they taste awesome! Traditional soft pretzels versus PretzelHaus soft pretzels... They are both good, but are different products. PretzelHaus pretzels are large, soft and more bread-like. They taste great and come individually wrapped and have a 1 year shelf life unrefrigerated! These soft pretzels are simply awesome. If I had to say anything concerning about them, it would have to be the amount of salt actually on each pretzel. You will need to add additional pretzel salt for the best results. After you heat these soft pretzels up, they will not disappoint. Very delicious pretzel for being pre made and heated in the microwave. 30 seconds in the microwave is all you need and it heats up nicely. Good tasting pretzel that are each individually wrapped. Can be stored on a shelf so it doesn't take up freezer or fridge space. Warms up nice in a pretzel warmer or oven. Excellent pretzels! They are soft and chewy and go excellent with the cheese sauce and marinara that we serve here. Highly recommend this purchase. Not overly salty either. The lightly salted pretzels from PretzelHaus are a great addition to our concession stand. They are well packaged and warm up quickly for a nice treat. Pairs well with our cheese sauce. Love that it's lightly salted because I hate my pretzels too salty. Perfect for any meal or just a afternoon snack. Great dipped in mustard too! 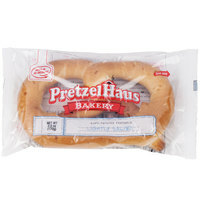 The PretzelHaus lightly salted pretzels are wonderful and taste soo good. They work great with our warmer and are great served with a cup of warm cheese. A good general pretzel. I like the fact that they are individually package - very convenient - little chance of waste while storing - and that they can be heated, stored if unsold, and reheated again later. We ordered all 3 types from Webstaurant - salted, plain, and cinnamon flavors. The only thing is I was a bit disappointed because the "salted" variety doesn't taste much different from the "plain/unsalted" variety. The salted version does NOT contain the big chunks of salt that some customers like, but rather, it claims that the salted flavor is added to the dough itself. We couldn't really tell any difference between the two taste-wise. I may look into finding pretzel salt and try to figure out a way to add that myself upon customer request. Our customers love these pretzels. We season them with a little pretzel salt and offer them with our house made beer queso or spicy mustard. The customers go crazy for them. They sell great! For a pretzel in the microwave these are really tasty and soft! Dipped in some nacho cheese and they are even better! Definitely going to be buying some more. The lightly salted pretzel has become a big seller in my restaurant. works well with the conveyer toaster. Just add a little liquid margarine and place in the toaster. Taste great. I absolutely love this product! These 6 oz lightly salted pretzels are great! They really are light on salt so If you like salt you may not be satisfied! But great with cheese or mustard! Lightly salted pretzel haus so soft and chewy and they are super easy to make. We like to brush them with a little butter on top to taste like a gourmet pretzel with a side of nacho cheese and they taste so delicious yummy! Pretzel Hause salted pretzels have a great flavor. They remind my of the frozen type but no freezer is needed. I am very happy with the flavor/taste and they fact they last well over a year. We are using the pretzels for a school carnival people are happy with the large size of the pretzel. Many prefer salted pretzels. At least these are only lightly salted ones. They are good. pretzels The quality and quantity are good for the cost. Wanting to carry jumbo soft pretzels, we googled "best soft pretzel" only to finally decide on this one. They are as everyone says - chewy, soft and quick to make. While you can put them through the oven, they heat up in 30 seconds in the microwave are are just as good. We brush melted butter on them, sprinkle on kosher salt and serve with honey mustard. They are a hit. Decent return on these as well. All in all, we give them an A+! Totally recommended. These are so delicious but I wish they came in a smaller case size. They are easy to store, easy to make, and such a great hit! Made the change this season to Pretzel Haus with nothing but positive reviews from our customers. They are easy to prepare and store. They are super soft and taste great. These are way better than the frozen ones we used in the past. Before we used super pretzels in our mobile food unit and they sold well but given our limited space it was hard to find room to store that much frozen produce. Because of that we had all but stopped selling pretzels. When I found these I was skeptical about a shelf stable and how it would taste but these are wonderful and our customers keep coming back to buy more. We sell them with a small portion cup of cheese. The only complaint we occasionally get is they are not covered in large salt like some other soft pretzels which is why I only gave 4 stars. If they offered a version with kosher salt on the outside as an option I would gladly give these five stars. Overall I highly recommend these to anyone but especially for those with limited freezer space. As always the service from webstaurant couldn't be better. These are great! Soft and chewy and exactly what I'm looking for. And so simply add pretzel salt and serve. Plus you can add toppings to these for added fun and great taste! Really like that the pretzels are individually wrapped. I cooked them in a toaster oven and they did fine. They did not have much salt on them though. I love having these pretzels at home. My family loves them and they don't have to pay the $$ at the mall for them. They are so easy to heat up and enjoy and they taste great. They made a big hit this weekend when we had a movie night. I'm going to start charging concessions fees LOL! I purchase these on a regular basis and sell both the cinnamon sugar and the lightly salted. All my customers like these. They sell all year round. These pretzels are always one of our biggest sellers at our annual county fair during the summer. they are super easy to prepare and taste amazing! These pretzels are always soft, never a bad one in the batch. Pair perfectly with some nacho cheese! Perfect amount of light salt; makes for a good lunch! Awesome Pretzel!! When I was first considering this Pretzel I contacted the company on several questions I had and they were very nice and answered all my questions I had. I have sold a lot of these and the customers just keep coming back for more!! Very easy to heat. just cut the end off plastic wrapper and pop in the microwave for 30 seconds !! I would recommend this pretzel!! OH MY love these pretzels. with cheese they are the ultimate. warm them up a little, dip in the cheese, oh soft and so yummy, I had to eat 3 right away. Hard to stop, shared with friends and family and they loved them too. I ordered a case of these soft pretzels for my sons football jamboree this past weekend. We had 7 teams from our league show up. Each team has a team of 3rd/4th graders (15-20+ kids) and another team of 5th/6th (15-20+ kids) graders. Not only did the boys and girls on each team show up but so did their brothers, sisters, mothers, fathers, grandparent, friends and much more. We were busy from 8am when we opened to 3pm as the last of the people left. These soft pretzels were a really big hit even though it was a 80+ degree day outside. The size of the soft pretzel was well worth the price and everyone that purchased one said the taste was spot on as if it was just made in the kitchen. I was also very pleased with the personal touch of the WebstaurantStore gave me with follow up emails about my order. The folks i spoke with were very friendly and knowledgeable. Highly recommended to others! These pretzel's have been a great seller! Customers love how moist and flavorful they are and many are repeat customers because they are so good. They are easy to prepare and sell. We highly recommend this product. This is a very delicious soft pretzel. You can eat either straight from the package as is, or warm from the microwave. This is a large soft pretzel.